Recently renovated in 2017/2018, our award winning retreat offers couples luxury, seclusion and privacy in a pristine environment surrounded by abundant wildlife and breathtaking views of the Atherton Tablelands. Listen to the sounds of the mountain wildlife while you relax in your double spa. Snuggle up in front of the warm wood fire or enjoy the natural air conditioning during the hot summer months. A unique luxury ecotourism ‘couples only’ experience. 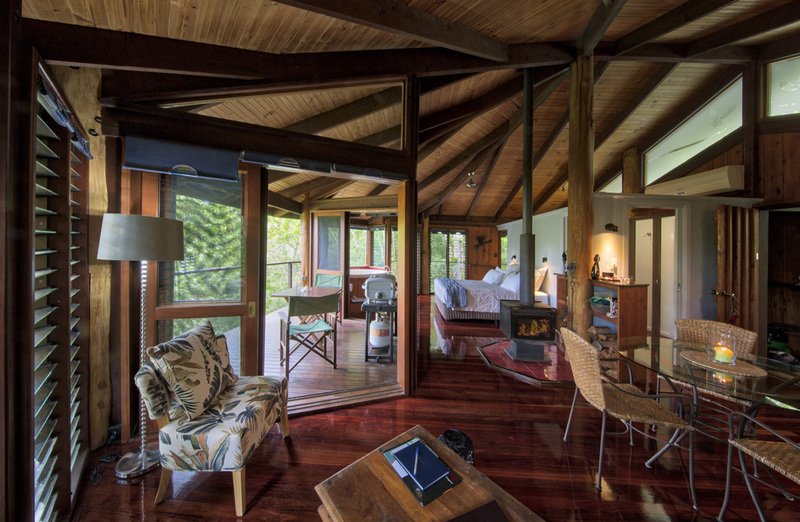 Each of our six treehouses is full secluded and completely private with extensive and varied stunning views. All include a double spa, luxury king size bed, comfy sofa lounge, fireplace and full kitchen facilities. Some have panoramic views of the tablelands while others have unique views of the Mt. Quincan Crater. Cross over to your treetop cabin by an elevated walkway and emerge into your private sanctuary. Elevated above the surrounding landscape, Mt Quincan’s forested slopes are a haven to relax and enjoy the scenic volcanic crater or views across the Atherton Tablelands. At 2500ft above sea level the retreat enjoys a far milder climate than the coast and without the humidity. A double spa and cosy wood fire are perfect to unwind. The rotating fireplace lets you enjoy the sight of your cosy woodfire wherever you choose. A complimentary basket of homemade muffins is yours on arrival. Cabin accommodation also includes provisions for a full Tableland country breakfast each morning. Enjoy on your veranda with nature’s wildlife and watch for the rare Lumholtz tree climbing kangaroos! For guests who enjoy a shower ‘alfresco’, Mt. Quincan Retreat has three ‘Canopy Tree Houses’ with this extra feature. There are only six luxury Tree Houses on the mountain – three of these have a second private veranda complete with an additional outdoor shower. If you would like to have the option to shower under the stars – make sure you choose a Canopy Tree House when you make your reservation. Double spa is part of the furniture, not part of the bathroom, surrounded with glass – some overlook panoramic views of the tablelands whilst others have unique views of the Mt Quincan crater. Imagine a tree-climbing kangaroo sitting just outside your window!! The bathroom features double showers with natural soaps and organic bath products, quality fluffy towels including additional luxurious larger bath sheets for your comfort and hair dryer. There is also an enclosed TV, DVD, iPod dock, surround sound, reading material, wrap around robes and knitted sox. WiFi Internet is also available at some tree houses and at our WiFI Hut at no charge to our guests. Of course there is the fully equipped kitchen -dishwasher, hotplates, convection microwave along with local plunger coffee, instant coffee, assortment of teas, sugar, oil salt & pepper etc. The private timber decks feature relaxing outdoor furniture, barbeques and spot lights to light up the surrounding forest. Guests are able to drive and park conveniently outside their own treehouse and then it is just a short walk down your own private boardwalk. For an added experience the Canopy Tree Houses feature (in addition to the double spa and double shower) a secluded outside deck and shower in the privacy of the treetops. All other features are the same as the treehouses. An invigorating delightful shower at one with nature is the ultimate indulgence and these cabins prove very popular with our return guests! Enjoy on your veranda with nature’s wildlife. Watch for the rare Lumholtz tree climbing kangaroos.